A baby born to a human couple turns out to be a mutant monster with an appetite to kill when scared. When I first saw 1974’s It’s Alive a few years ago, it offered a pleasant surprise. While I expected nothing more than a “Z”-level Exorcist rip-off, it actually delivered a surprisingly subtle and creepy experience. That made me curious to check out the flick’s 2008 remake. Both share very similar stories. Pregnant grad student Lenore dhsads (Bijou Phillips) leaves school to set up house in the country with her boyfriend Frank (James Murray) and his younger brother Chris (Raphael Coleman). Soon after her arrival, Lenore goes into a very painful labor at six months gestation. Bizarrely, the fetus doubled in size in a brief period, so the doctors immediately go for an emergency C-section. During the delivery, someone brutally slays all the doctors involved. While police investigate this hideous crime, Lenore and Frank take home infant Daniel. He shows abnormal size and strength, and also proves to be a vicious little dude; he draws blood when he scratches Frank and when he nurses with Lenore. From there, he develops a taste for meat, so he catches, kills and chows on small animals. Intensely protective of her son, Lenore denies any problems and becomes totally withdrawn from friends and her school responsibilities. This becomes more and more difficult to do as Daniel’s ferocity increases. The film follows his escalating series of kills and Lenore’s attempts to cope with them. As I noted earlier, the original Alive gave us a surprisingly subtle horror tale. No, it wasn’t confused for some art house effort, but it was much less schlocky and silly than I expected. That allowed it to rise above its genre roots. I can’t really say the same for the remake. To its credit, it does attempt to differentiate itself from the original to a moderate degree. In the old flick, the baby was obviously a demonic little beast from the start, whereas here it takes a little while for his “talents” to flower. In addition, the 2008 version doesn’t make Daniel look like a monster physically. Originally he was a deformed little critter who lived on the streets while his protective mother tried to help; this time he looks like a normal baby but his behaviors tell us something else. Those factors mean that the 2008 It’s Alive should be the more subtle version of the two, but unfortunately, it’s not. Perhaps because it avoids the obvious horror trappings of the original, it telegraphs a lot of its other elements. Take Lenore, for instance. Ala Jack Torrance from The Shining, she seems a bit nutty even when she’s supposed to be normal. This makes her psychological journey less interesting. Since we already see her as something of a nutcase, we don’t feel much when she deteriorates even more. Rather than go from “A” to “Z” – or even “N” – Lenore shifts from “Y” to “Z”. It’s a short trip from nuttiness to super-nuttiness that she takes, so we don’t ever really get involved in her side of things. None of the other characters ever become more interesting. Frank is just a semi-handsome meatbag there to give some contrast to Lenore, and I’m not sure what purpose Chris serves at all other than as Killer Baby Fodder. The police personnel who get involved in the case exist in the same way; other than Lenore, everyone’s in the film to give the baby folks to kill. Without the same strong sociological/psychological subtext that the original boasted, the remake just turns into a standard jolt-fest. Few of the attempted shocks affect us because we can see them coming well in advance. They offer no real shocks, and the presence of graphic gore just seems desperate to me. A better horror movie wouldn’t need grotesque elements to get a reaction from the audience. 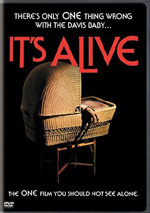 In truth, I wouldn’t call the 2008 version of It’s Alive a bad film, but it does nothing to improve on the original. It just offers generic horror nonsense without much to make it distinctive. I’ve seen worse, but I’ve seen better, too, including its immediate inspiration. It’s Alive appears in an aspect ratio of approximately 2.35:1 on this single-sided, single-layered DVD; the image has been enhanced for 16X9 televisions. This was a mediocre transfer at best. Sharpness came with good and bad aspects. A fair number of shots exhibited positive delineation and accuracy, but plenty of others suffered from overt flaws. In particular, I noticed some prominent edge haloes, and those made wide shots awfully blurry. No issues with jagged edges or shimmering occurred, though. In terms of source flaws, I noticed a handful of small specks. The transfer also exhibited light mosquito noise, though the edge enhancement was the main problematic artifact. Colors seemed bland, though much of that was by design. The movie didn’t boast a dynamic palette, as it usually stayed with quiet earthy tones. These came across as somewhat dull, but they were acceptable within their stylistic limitations. Blacks were decent, but shadows offered another weakness, as low-light shots were rather thick and muddy. I saw enough positives to boost this to a “C-“, but don’t expect memorable visuals. The Dolby Digital 5.1 soundtrack of It’s Alive was also lackluster. I found a mix with a definite lack of ambition. Honestly, much of the audio seemed to be glorified monaural. Music and effects spread to the sides – and the surrounds, to a lesser extent – but they didn’t display much in the way of clear separation or delineation. Instead, the soundfield felt mushy and without much to give the various elements space and definition. At least audio quality was decent. Speech came across as reasonably natural and distinctive, and I noticed no edginess or other flaws. Music favored somewhat extreme highs and lows, without much midrange. Effects appeared acceptably accurate and full, and they showed decent bass at times. While not a bad mix, the semi-monaural impression left it as a “C-“. In terms of extras, we get almost none. The DVD opens with some ads. We get clips for Infestation, Monster, Command Performance and Into Temptation. These also appear in the “Previews” area along with the trailer for It’s Alive. While not a terrible remake, the 2008 version of It’s Alive does nothing to improve upon – or equal – the surprisingly good 1974 original. It throws in graphic violence and cheap scares but lacks the basic creepiness of its predecessor. The DVD presents lackluster picture and audio and comes with virtually no supplements. This becomes a flawed release for a forgettable movie.